Crush the crystals, come away with the cash, sounds simple enough right? Playson have done it yet again, they have exceeded our expectations in the creation of this online slot available here on Wizard: Crystal Crush. If you have ever played a cluster slot before, then you should have an idea on how to approach this one. 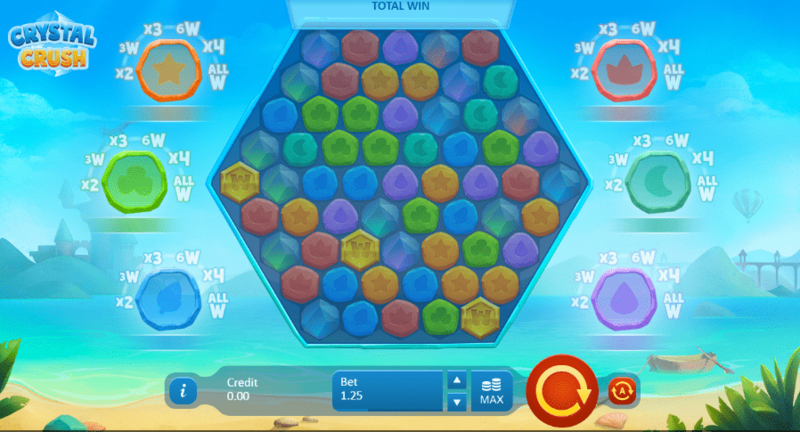 Crystal Crush is a slot that plays out over a honeycomb, and it is your job to group together symbols inside of this comb in order to string together wins! Since this is a Playson slot, you can expect there to be quite a few hidden secrets that you must unravel, but essentially you will be wanting to play this one for the sheer quirkiness of it! Check out the review below to find out how you can best approach this one! You may view 2019 slots games today. If you’ve never had the pleasure of playing a cluster slot before, then you are going to be in for a surprise. Discover why this game is considered one of the top-rated slots in the UK. Wilds: Yes wilds are here! Wilds will substitute symbols as the game sees fit. When matching wilds you’ll find that a bunch of clustered symbols will substitute themselves for other symbols that could lead you to throw your scores even higher. Multiplier: An active multiplier plays a big part in this slot too, this multiplier can be activated in many different ways. When activated you’ll find that your scores are elevated almost instantly. If you are chasing those high scores then you will want to be using the multipliers.